National Digital Learning Day occurred for the first time on February 1, 2012, and nearly two million participants in 39 states were expected to mark the occasion. Federal Communications Commission Chairman Julius Genachowski and Secretary of Education Arne Duncan were among the high-profile leaders of the event, which included a National Town Hall meeting, nationwide competitions for teachers and students, and additional events at the local and state levels. Goals of Digital Learning Day are to encourage the use of technology in education by motivating teachers and to publicize the potential benefits of digital learning. The Digital Learning Day campaign provides a variety of resources for bringing technology to the classroom and beyond. Teachers and librarians can take advantage of toolkits with grade-appropriate lessons, tips for effective teaching and networks for increasing collaboration. The campaign also supplies toolkits for leaders at the school, district and state levels, for parents and for community leaders. Companies that sponsor the movement include USA Today, technological innovators, such as Google, Comcast and Intel, and well-known names in education, such as McGraw Hill, Kaplan and Houghton Mifflin. A goal of Digital Learning Day proponents is for students to be exposed to technology as an integral part of their education. The idea is that these students will be more motivated to learn and better prepared for a future of rapidly changing technology. Examples include using internet encyclopedias to conduct research and using e-books instead of textbooks to have better access to the information they want. Students can develop online communication skills, such as emailing and making audio and video calls. Digital learning does not need to stop in the classroom, and the Digital Learning Day campaign refers to this concept as blended learning. An example might be using smartphone applications to play learning games or study new concepts. Online learning and new technology are entrenched in colleges, and students who are already familiar with adapting to new learning methods in their classes may have more confidence that they can succeed in college. The leaders of Digital Learning Day encouraged high school students to recognize the potential benefits of e-learning. In fact, the day’s video challenge contest for students in the high school category was to describe how digital learning makes them more ready for college and their future. Some high school graduates must work full-time jobs to pay the bills and support a family. In the old days, pursuing their education may have been just a dream, but modern online programs can make college a reality. Instead of attending lectures on campus, students can attend classes and complete their assignments on their own schedules as long as they have Internet connections. Exposure to technology and digital learning in grade school may help make students aware of their potential to succeed in college. 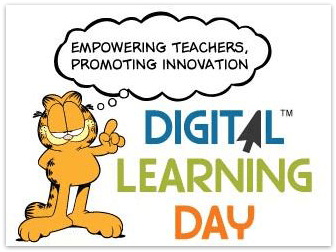 Digital Learning Day helps to increase efforts to improve education by placing the issue on the national stage. The day is a celebration of innovative learning techniques. 40 percent of schools currently use some form of digital learning in their classrooms, and the rate is increasing. Students who use e-learning techniques may be more involved in their learning and confident about their futures. About the author: Derrick Cruise is a professional writer living in the Indianapolis area. He specializes in technology and online education articles. Well, it was great to hear that such a day was established as it could be a great thing to introduce teachers to new technology and vice versa. CAn anyone take part in the day? I mean can techers from other countries join the day?